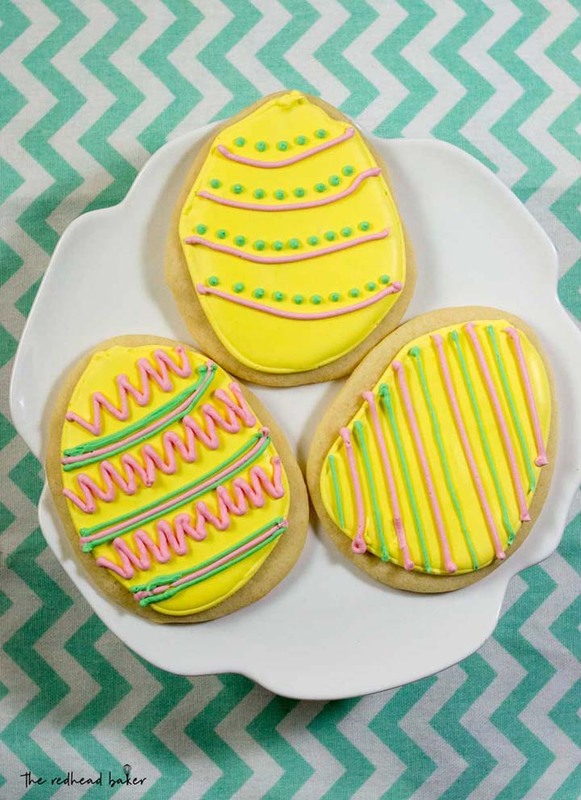 These Easter Egg Sugar Cookies are an adorable treat that you can display in your basket or on your table. They make a much sweeter treat than real Easter eggs! I love doing all the holiday traditions with my son that my parents did with me. We go to see Santa every year, we bang pots and pants for New Years Eve, we go out trick-or-treating (bringing along a plastic bag for storing collected candy once the pumpkin bucket got too heavy), and each year, we dye Easter eggs. Dying the eggs is kind of a pain. Buy the eggs, hard-boil the eggs, set out the newspaper to protect the table, cringe as he nearly tips over the cup of dye every time he pulls an egg out, and once they’re done, they …. sit in the fridge until weeks after the holiday. None of us is really a fan of eating hard-boiled eggs. 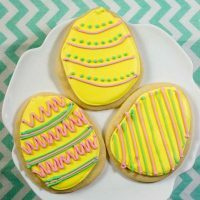 If you’re in the same situation and don’t want to waste a dozen eggs, try decorating some Easter egg sugar cookies this year! 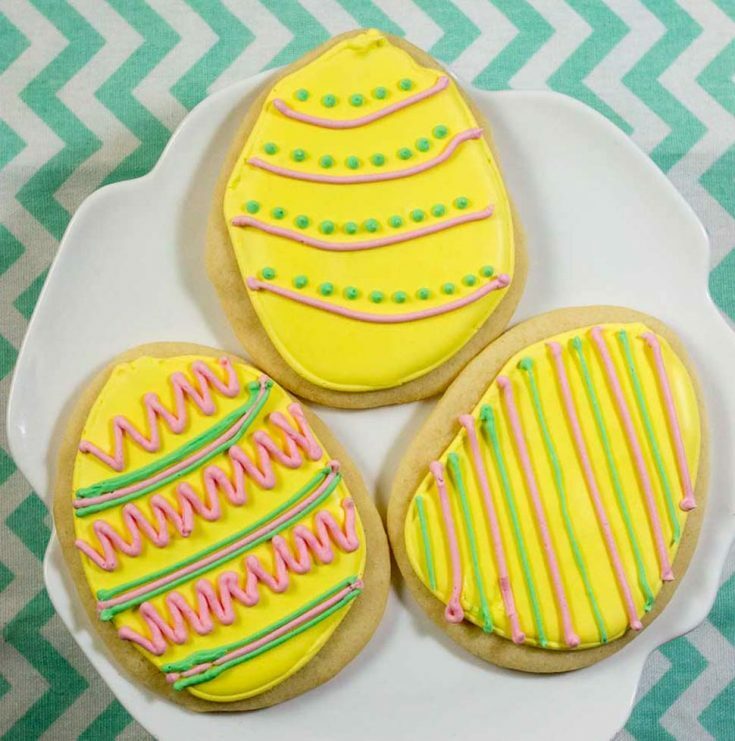 This recipe makes about 2 dozen large egg-shaped cookies. The decorating possibilities are endless! I can’t promise it will be less messy than dying actual eggs (I mean, we are still working with food coloring here), but at least the end results will be tastier. The cookies start out with Katrina’s Kitchen’s delicious no-chill sugar cookie dough that has become my go-to for all cut-out decorated cookies. Let your butter sit out at room temperature for about 30 minutes before beginning the dough. If you let it sit out for too long, your dough will be too soft to work with. If you can’t or don’t want to use almond extract, simply leave it out. While the cookies are cooling, make the royal icing. Your bowl needs to be perfectly clean and dry, because we are working with egg whites, which won’t whip if there is any speck of fat in the bowl. I recommend washing your bowl, drying it, wiping it with a splash of vinegar, rinsing and drying again. Once the royal icing is mixed, always place a damp paper towel or piece of plastic wrap over the bowl of icing to prevent it from drying out. When working with food coloring, especially the gel type I recommend, always start with just one small drop of color, then beating to incorporate. The yellow “base” on my cookies is from one drop of lemon yellow food coloring! You can always add more if you aren’t satisfied with the color. But the colors get very intense very quickly. 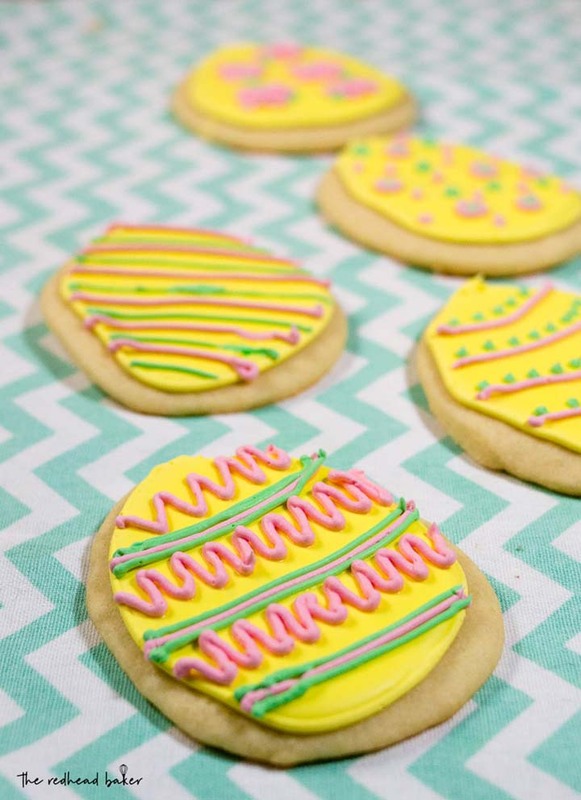 These are great cookies for beginner cookie decorators because your base simply involves tracing the outline of the cookie, flooding it, and the decorations can be as simple (dots, straight lines, etc.) or as intricate as you like. Get yourself a basic piping kit and start experimenting! 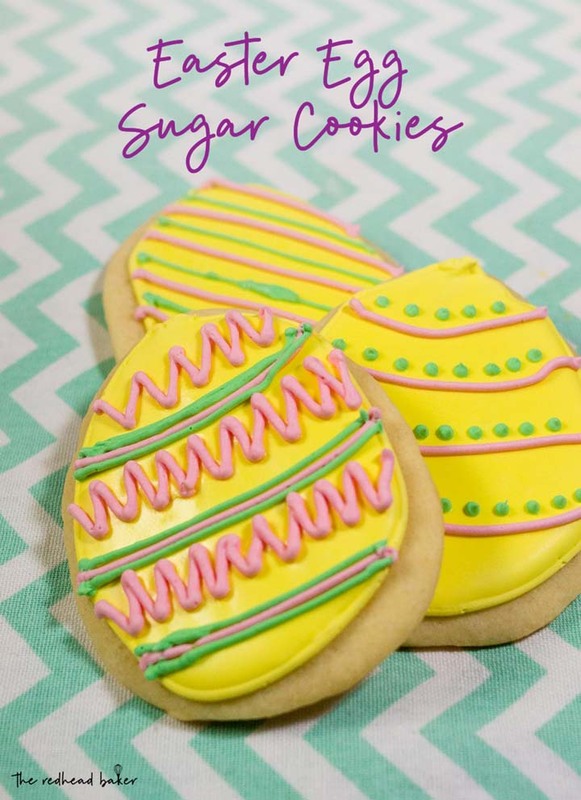 These Easter Egg Sugar Cookies are an adorable treat that you can display in your basket or on your table. Preheat oven to 350° F. Line two sheet pans with parchment paper and set aside. In the bowl of your mixer, cream together the butter and sugar until smooth. Beat in the egg and the extracts. In a separate bowl, combine the flour, baking powder and salt; add to the butter/sugar/egg mixture. The dough will be very stiff. Do not chill the dough. Dust a clean, flat work surface with more flour and roll out the dough to 1/4-inch thickness. 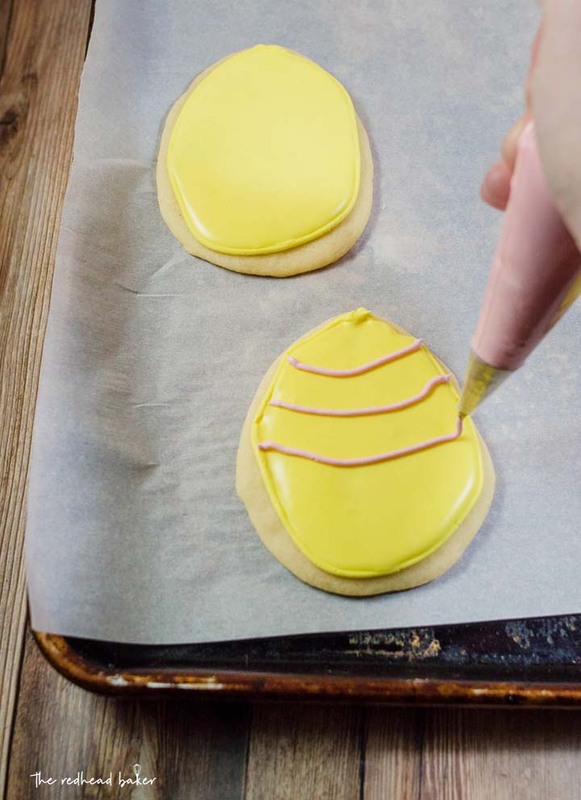 Cut out your Easter eggs, and carefully transfer to the prepared baking sheets, leaving 2 inches of space between cookies. Bake at 350 for 8 to 9 minutes. Let cool on the cookie sheet until firm enough to transfer to a cooling rack. While the cookies are cooling, combine the meringue powder, powdered sugar and 3 tbsp of warm water in a clean medium-to-large mixing bowl. Beat on medium-low speed for 5 to 7 minutes. Take one quarter of the royal icing, and transfer to a smaller bowl. Cover with plastic wrap. Take another quarter of the icing from the first bowl and transfer to a smaller bowl; cover with plastic wrap. Tint the first bowl of icing whatever color you prefer. Fit a piping bag with a #4 plain tip, and fill halfway with the icing. Trace around the edges of each cookie. Squirt any icing back into the bowl. Add another tablespoonful of water, and beat to incorporate. The icing should be thinner. Spoon the thinner icing back into the same piping bag, and flood the center of each cookie, using a toothpick to guide the icing to the edges. Set aside to dry for at least two hours. Tint each of the smaller bowls of frosting whatever colors you choose. Use these colors to pipe decorations onto the royal icing "base" you made earlier. You can use a #1 or #2 plain tip to make dots or lines, or if you're feeling more adventurous, use petal and leaf tips to make small flowers. Store the cookies in an airtight container, unstacked, at room temperature. So talented! I wish I was good with royal icing! These are beautiful! I’d like for the Easter Bunny to leave me a couple of these adorable cookies.